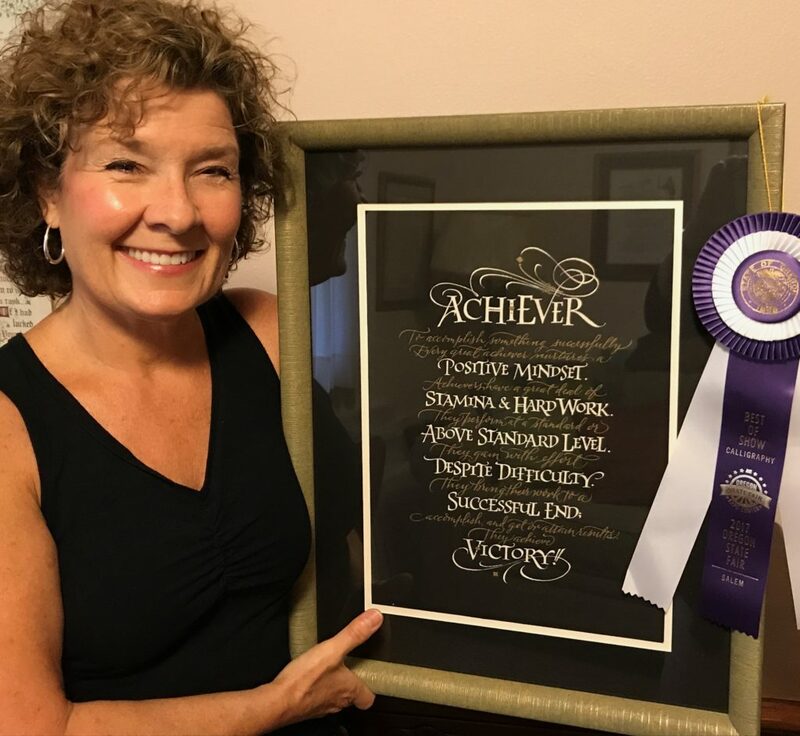 It had been my hope to venture back to my former Midwest town of Cincinnati, where I had developed my calligraphy business over 38 years. Am I really that old? Geesh! 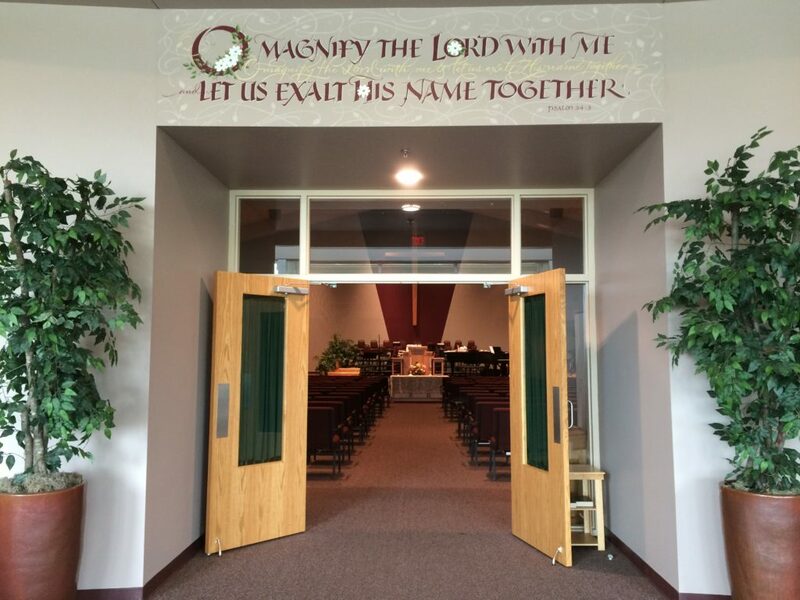 The Evangelical Community Church, on Struble Road made that possible when they invited me to create a design for Psalm 34:3 that would set the tone for worship as people came through the sanctuary doors. 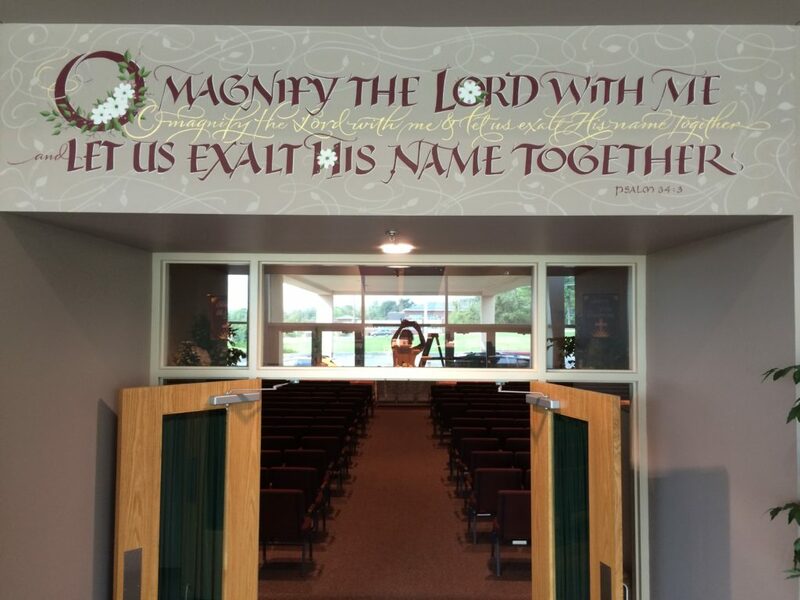 “O magnify the Lord with me and let us exalt His name together.” Read on for the process report. 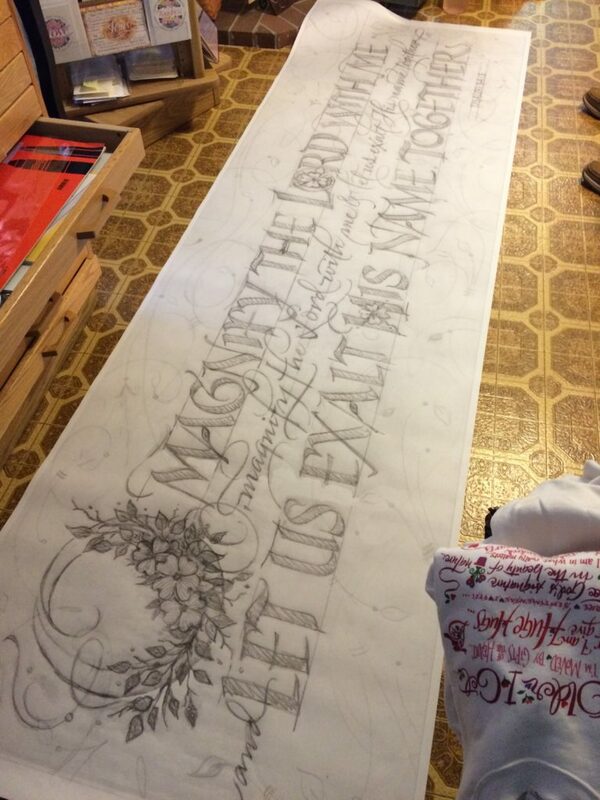 Before I explain this calligraphic adventure, here is the wall in it’s finished form…. 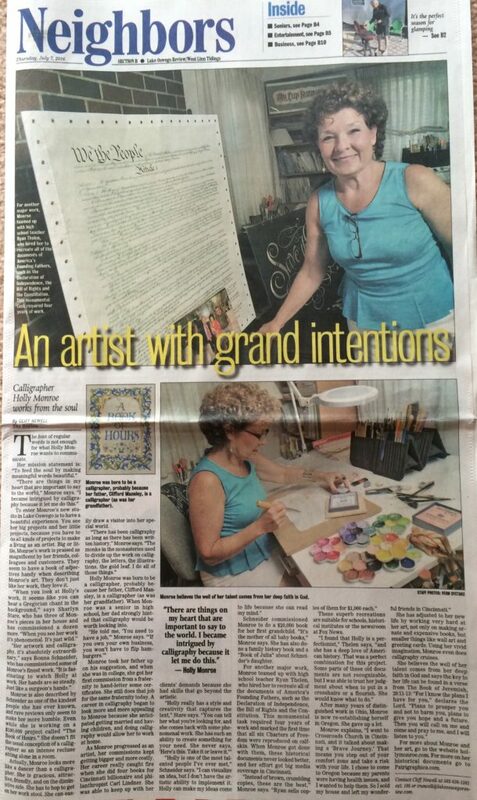 This is for you calligraphers and others who want to get a glimpse of the process. The struggle. The birth of a design. It is tough to show you all of my roughs as I had about 100+ scans and photos in all. Some were pieced together in Photoshop because the roughs were bigger than my scanner. This first one was the initial sketch. Three lines that weren’t reading right. Ohhh, I didn’t like this one at all, but I had to start somewhere. The church committee wanted 2 lines, legible, traditional. This one was rejected as were a number of other sketches. 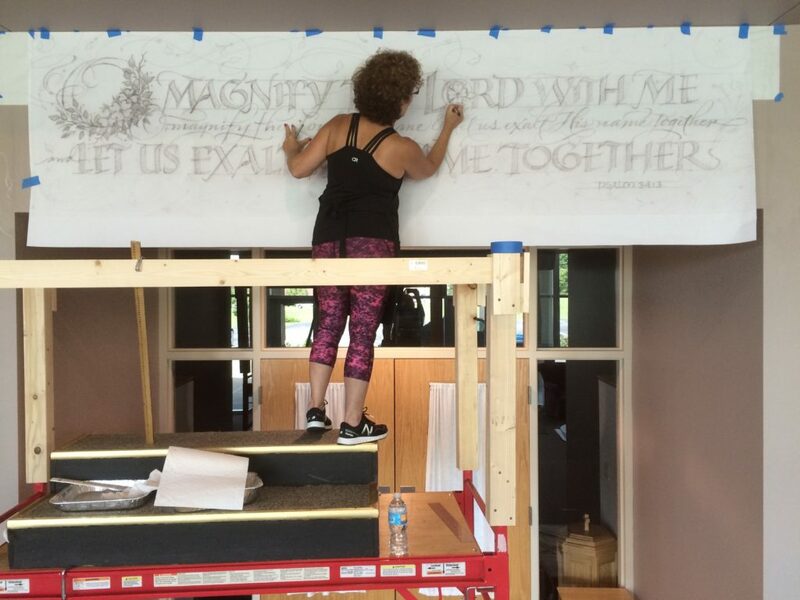 So I tried 2 lines of caps with a line of script, repeating the Psalm, for interest and to fill out the 3’x10′ wall . They wanted all of the E’s to be the same. I had rounded and squared E’s here. More revision. I tried a completely different lettering style, more contemporary with simple Rose of Sharon flowers. But the committee wanted Dogwood flowers and didn’t like this chunkier lettering style. In this version, I revised the dogwood flowers from 5 to 3 in the capital O, but I had too many leaves that didn’t flow well. Since the wall area was a defined space, the flourishes seemed haphazard and incomplete. Then I added them to the artwork in Photoshop. I revised the script line. The committee saw this, but couldn’t imagine it without the color. I did a color rough (these are a little out of order…the color rough came when I had 5 flowers in the O, but that showed me that I didn’t want 5 flowers, they were too small). 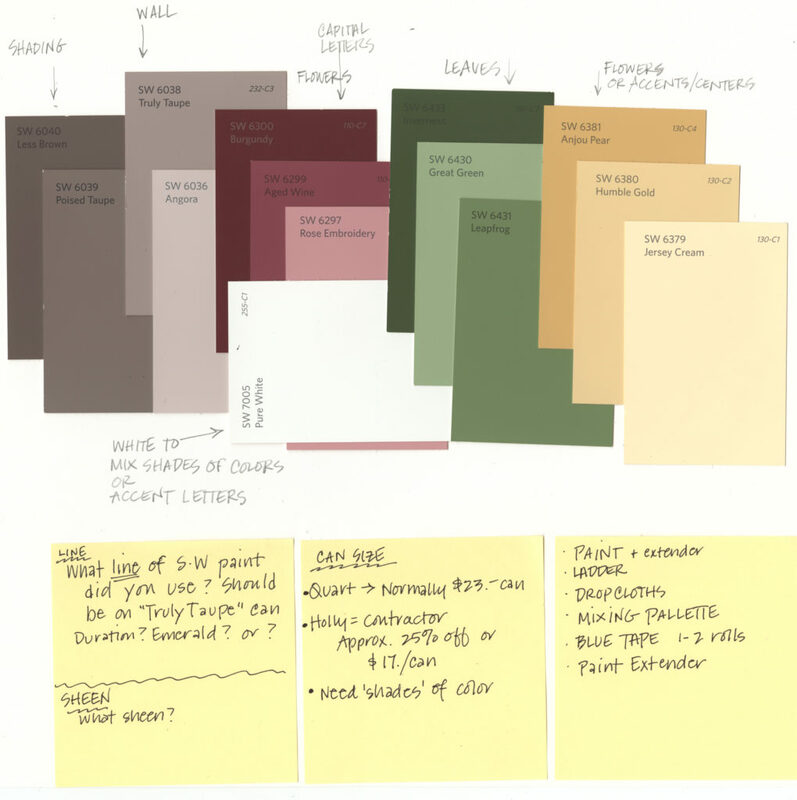 I went to Sherwin-Williams and made a paint chart. I used some of these colors, eliminated what I could, mixed the brown from the red and green and at the last minute added Temperate Taupe for the background flourishes. Whew! I think I used 7 colors total, plus 24k gold leaf. Then, I used my WN gouache to imitate some of the SW colors that I chose and mocked up this rough on handmade paper. It helped the committee visualize and also showed me what I needed to revise. You can see in the Fedex enlargement below, I had a few more pencil revisions and then this became the final design. 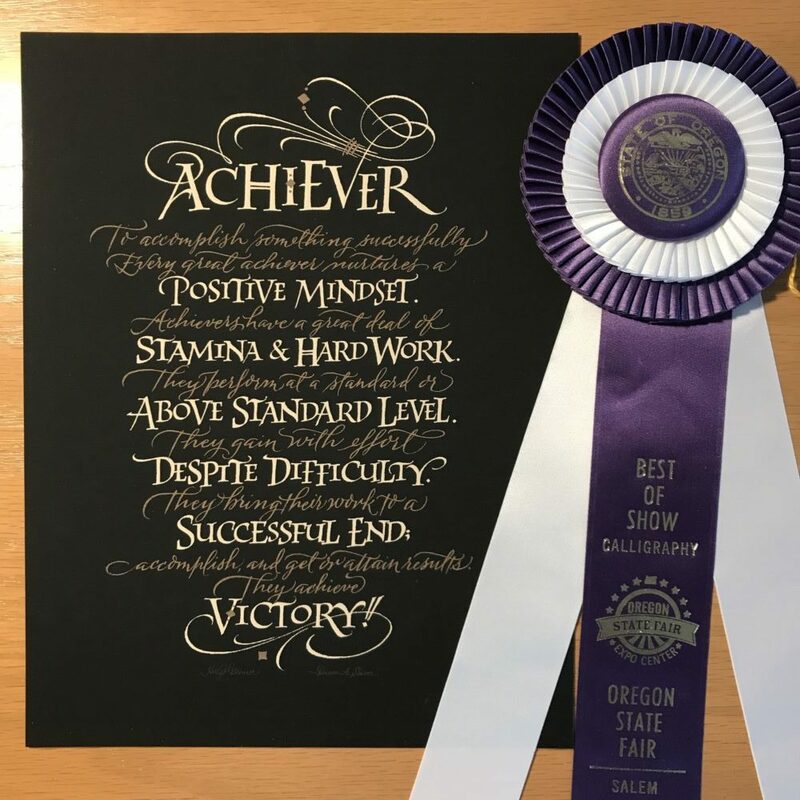 Since I thought that the wall space was 3’x10′, Fedex’s 3′ wide roll paper enlargement was perfect, so I printed in Oregon. The only problem was, the space was not measured exactly and when I got there, the wall space was 30″ x 10’6″. Fortunately, I have an account with Fedex, the design was uploaded on their site and I could reprint in Cincinnati. I shrunk the design by about 5% so that it would fit the space. I taped up a 12″x11′ strip of white Saral transfer paper and penciled over the enlarged design, shifting the Saral paper down as I went. I could have bought 3 rolls, but was I was a cheapskate. 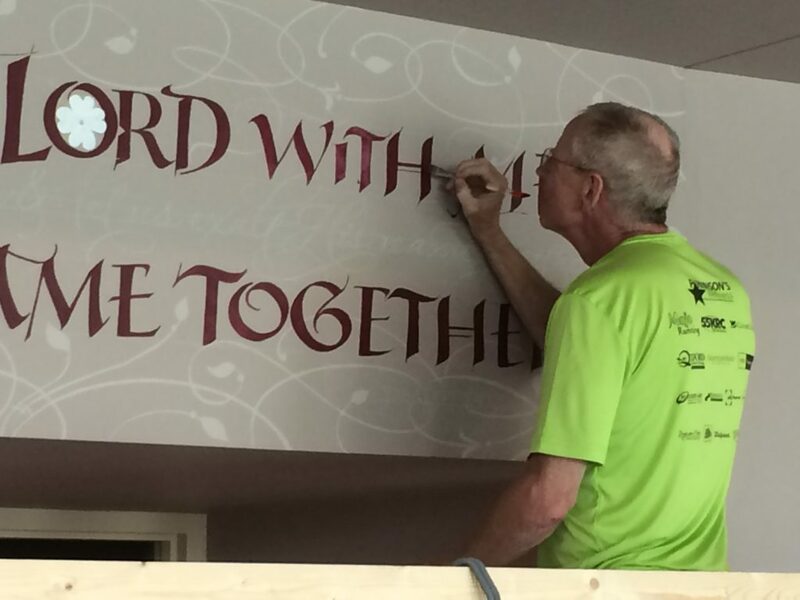 The design transferred beautifully to the wall, so that I could see where I was going to letter & paint. Saturday, September 3rd, the painting began. I painted the background flourishes first. Temperate Taupe on top of Truly Taupe. Just one shade away from each other. 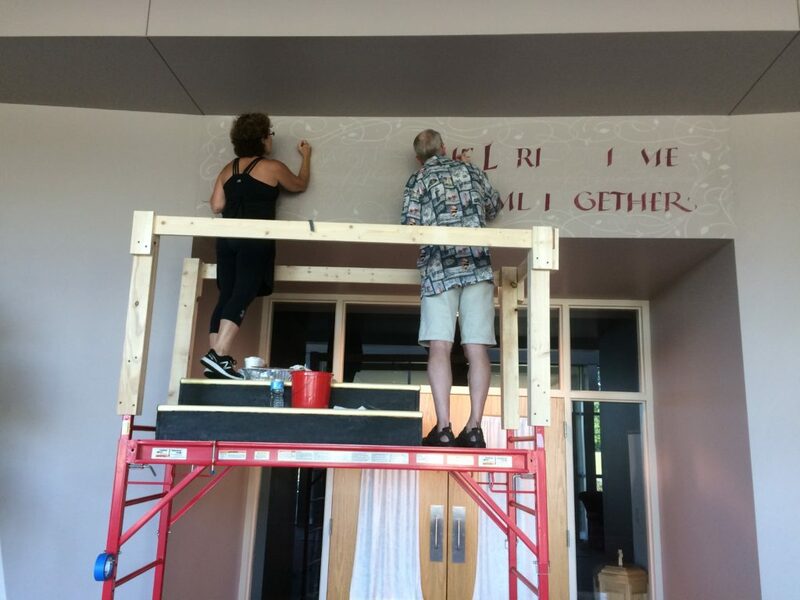 On Sunday, my friend David Ogden arrived to help me begin painting the letters. I was training myself to accept assistance on my design. David knows his letterforms well, so I trusted his expertise. Since we needed two layers of the paint on everything, his help made it possible for me to finish on time. Sure looks like the Wheel of Fortune game in this picture! 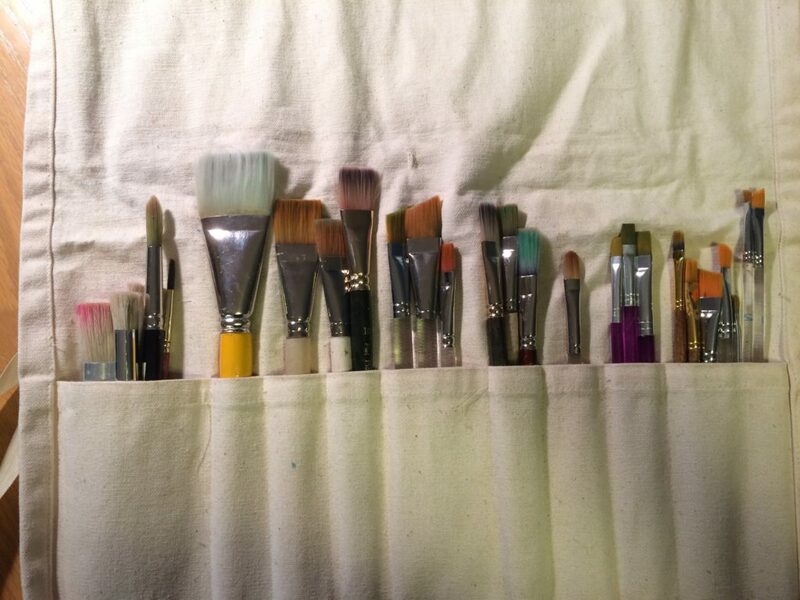 I found that I needed to buy a few additional pointed brushes in addition to the flat brushes I took. 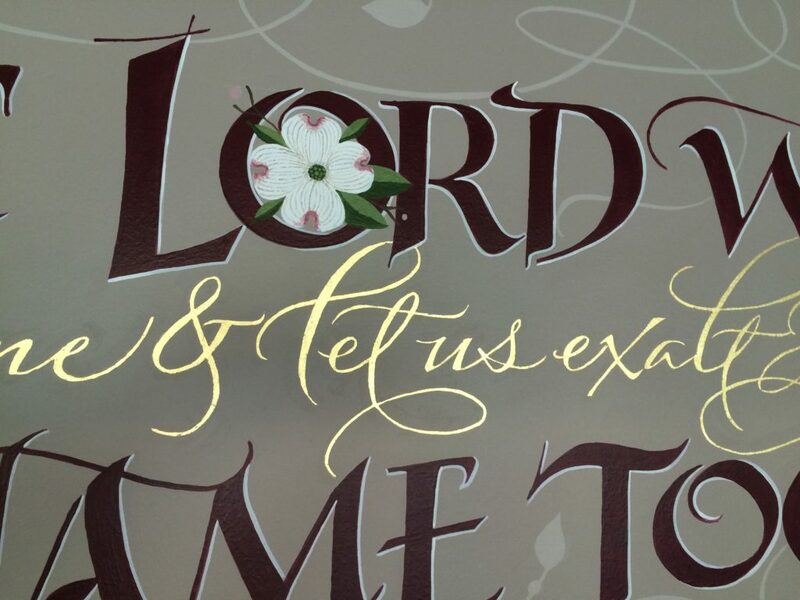 Then I laid the Gold Size for the ‘loose’ gold leaf lettering. Sorry, no picture. It was hard to see on the wall. I ran into a problem with the gold leaf. 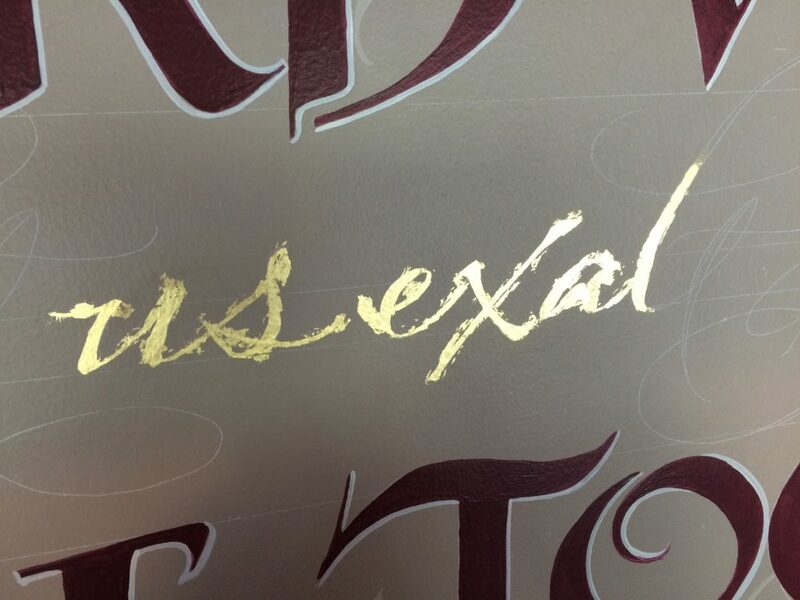 This was the first time I lettered a line of script on a wall and applied leaf to it. 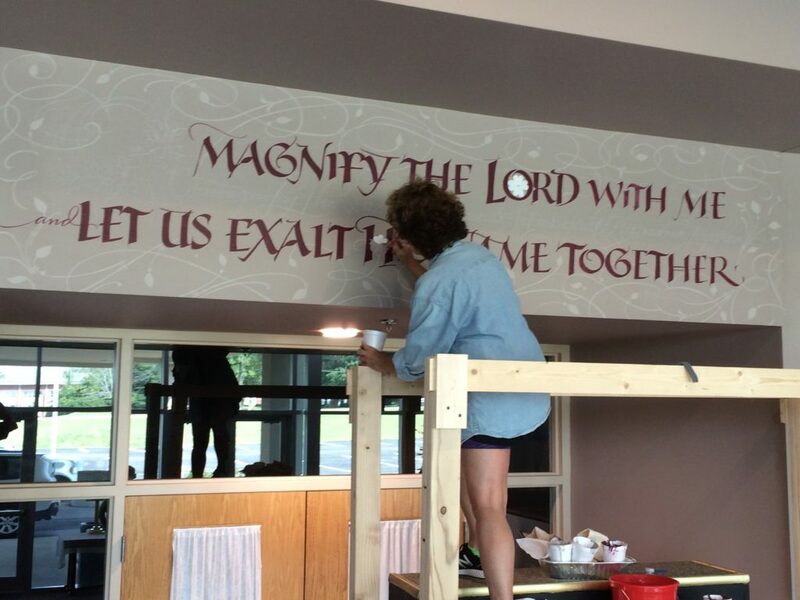 (I laid leaf in larger areas on the wall at Northminster Presbyterian w/o a problem). The gold leaf stuck to the wall, I needed precision. Ugh! I called my life lines….Jerry Tresser suggested ‘resist’, but that would take a long time and I had a plane to catch at the end of the week. David brought patent gold leaf, but it was a different color and not as shiny. 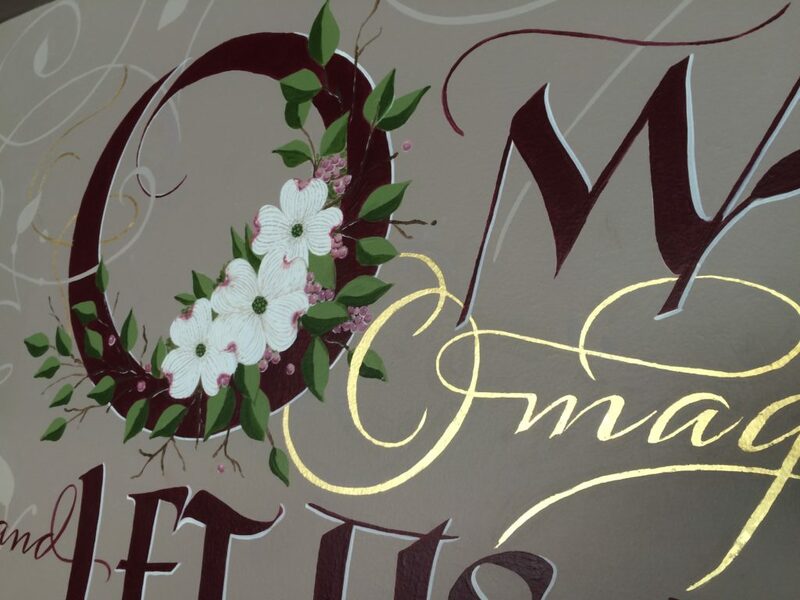 I opted to carefully paint over the excess gold leaf, outlining the gold letters. This problem added 8 hours to my work. After speaking with Lee Littlewood in Oregon, he suggested that the next time, I powder Kaolin on the wall so that the gold doesn’t stick. I’m so used to laying gold leaf with gesso on vellum that I had not run into this problem before. Live and learn! The capital O with the flowers was painted in with some detail…. And voila, after about 3-4 weeks of labor (2+ design weeks, 6 painting days plus travel time), the wall was finished! I am grateful to Diana Wood for her thorough and patient communication as she headed up the project, Joyce Williamson for the airfare, Sue Crosset for a private bed, bath, breakfasts & extra brushes, Donna & Gail the other two committee members, John & Judy Gould for a snappy little orange Subaru which gave me transportation all week, Otto for all of the facility arrangements and safety structure on the scaffolding, lunches and friendship from church members all week…I don’t remember all of the names…Jack & Linda Young, Sandy Irwin, Amy Kindell, Charlie and Jan Mahler and others. You were all so supportive – a BIG thank you! 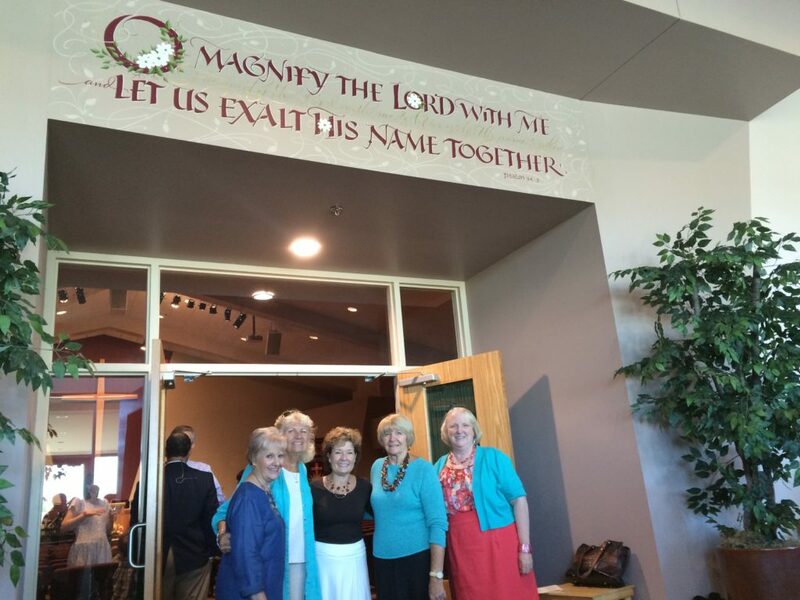 The Evangelical Community Church committee that worked with me. Sue Crosset, Donna Peterson, Me, Gail Suiter and Diana Woods.